Sara is picky eater and wants some kind of roti for all her meals. When I don’t want to make roti or chapatti I go for chickpeas pan cake. I give it to her saying its yellow coloured roti. 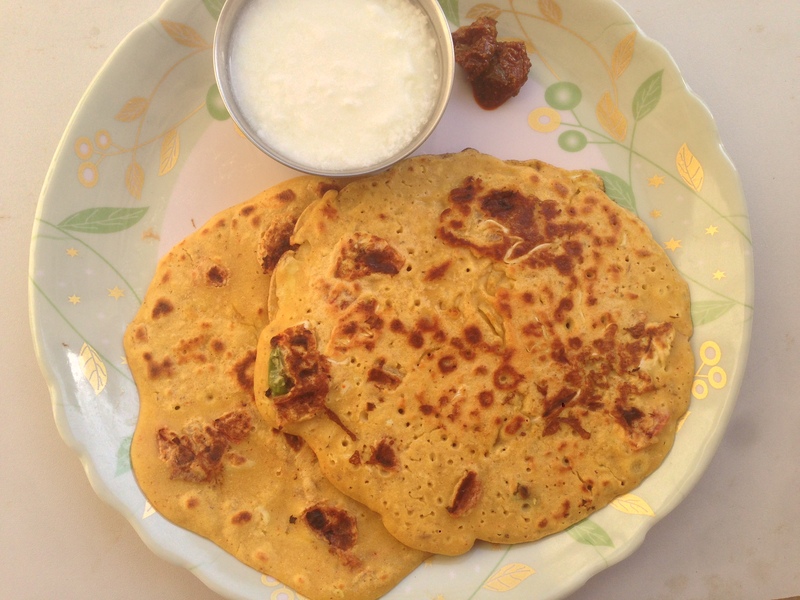 Chickpeas pancake is known as besan chila and its quick recipe. You can make it as a breakfast or light meal. It needs chickpeas flour, rice flour and vegetables of choice.It can be served with choice of chutney or just sauce. It makes perfect meal accompanied with any vegetable curry as well. Following is recipe of chickpeas savoury pan cakes with shredded cabbage in it.Cabbage is optional in this recipe and you can make plain pan cakes as well. Or can add any choice of vegetables grated or chopped in it. Enjoy making this yummy breakfast chickpeas pan cakes and let us know feed backs in comments section. Take a big bowl and mix besan and rice flour in it. Wash ans chop all vegetables. Add curd in it flour and keep it aside for half hour. Add finely chopped tomatoes , cabbage, chilies and coriander leaves in mixture and mix well. Add dry spices and water in batter. Heat non stick pan and apply oil on it. Pour one bowl of batter on pan and spread it to make a chila. Roast chila on both sides and apply oil if necessary. Serve besan , cabbage chila with chutaney.